Bayts duq dz@mer uniq? Dun mer qov yekur yev khashe hos kudenq miasin. Ays gisher 10 cm dzuyn e galis mer mot. Ay Axper America em yekel or Dzuyn mAqrem ?? OK yete 10 cm qitch e? urbat or@ 20 cm yeves bit qa. aaaaa iskakan xash ay Gymuri pity gnas, sexani mejtexnel vochxari glux@ drats. Edited by ED, 16 December 2008 - 07:17 PM. Chmorananq asenq vor xash@ chi sirum 3 hat ban - zarmanalue vor yereqnel nuyn taroven sksum - K, K, K.
Hi Ani, this is special for you. An jan, mi @nkeruhi unem enpes e xashi totikner maqrum qefd kga - pincetov & xoshoratsuytsov ... isk heto handznum e mer myus @nkeruhun vor@ QC-n e apahovum. Anshusht, mer nakhniner@ giteyin inchpes haletsnel mazer@, totikn ou gloukh@ ayreyin kam tatakheyin/mkhrjeyin LYE i mej, mazer@ pettelou, bayts I hejouks mazn ou moushtak@ takuyn mnayin kjghakneri mijin. Bararan@ ase or LYE nshanaki “mokhrajour”. It is not without reason as LYE, Sodium or (Potassium) Hydroxide is obtained from ashes/mokhir. Hey Maral! Do you know how to make "ddoum shakar/candied pumpklin? I have made it, but it was so many years ago when we used lime to soak overnight to make the pumpkin hard and crispy. I don't know, maybe as suggested below baking soda will do the job as well. Edited by Arpa, 18 December 2008 - 11:45 AM. Sunday morning Khash Time. Ummm ! I can smell all the way here. The young man skillfully removes the lower legs of a cow from the boiling water of a huge copper pot, and immediately puts them into cold water. Then he starts cleaning the rough hide of the hooves. His hands, unlike the fated cow feet, are used to the hot water, used to the cold water, and the ritual that defines his life as a maker of Khash. “I clean 50-60 hooves per day. It is only morning, but I have already managed to clean 10 pairs, that is to say, 40 feet” says Karen Hakobyan, who works in the “Khash District” of Echmiadzin. Khash is an Armenian national dish of boiled tripe and the lower parts of cow legs/feet, it is traditionally served with dry lavash, garlic, greens, vodka, salty vegetables, radish. It is, too, traditionally served in the coldest part of winter. On this unusual street in Echimiadzin, however, the dish is a year-round specialty. Since the 1990s, the seven families of Vardanyan brothers who reside in 154 Mashtots Street are the initiators of this business that has become something of a tradition. In the town, it is well known as “khash district”. Hasmik Makaryan, 53, wife of one of Vardanyan brothers (Arayik Vardanyan), says that her mother-in-law started their business, and later they – the daughters-in-law and their husbands continued it. “This is how we earn money. We have all got education, but we needed to live, to survive somehow, therefore we started this khash business. People were telling our address so often that as a result the name of our district has become ‘Khashi Tagh’,” Hasmik says. The brothers’ houses are next to each other. If Arayik does not have the product a client wants, then he sends him or her to Vardan’s house, and if Vardan does not have it, then – to Rafik’s house, and so on. “Our work consists of several ‘operations’. The first one starts in a bathroom, where cow’s feet are cleaned of the fibrous skin,” Hasmik explains, passing a pair of legs to Karen. The resulting smell is not for the faint, and it leaves the bathroom and enters the whole yard. The Vardanyans don’t even notice anymore. Even though the number of khash eaters essentially drops in summer and spring, the work in ‘Khashi Tagh’ does not stop. The cleaned and assorted khash bits are stored in refrigerators in anticipation of the winter season. 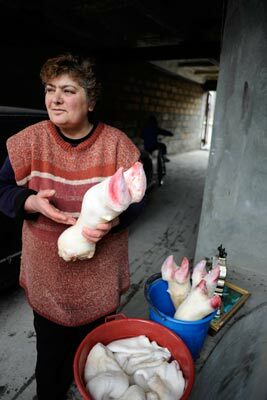 Hasmik’s son – 22-year-old Armen uses a razor to get the toughest bit of hide from the cow leg. “We represent ‘The Vardanyans Group’, you may even search us through Google and you will find us as the best khash cleaners,” Armen says joking, putting the next clean product aside. The Vardanyans’ clients are not only from Armenia, but also from the United States, the Netherlands, France, and Germany. “All restaurant owners from Proshyan Street [a well-known street in Yerevan famous for its restaurants, where Armenian barbeque and khash are served], take khash legs from us. The khash served on the top of Mount Aragats is also ours,” Hasmik says proudly. Specialists in khash are guarded while talking about incomes and expenses. They say that their torment and bad smell prevails over their income. They buy cow legs from butchers, the prices range from 1,000 to 5,000 ($2.7-$13) drams each, depending on the size and quality. Hasmik explains that the family business has reached the point of being able to become more involved in distribution and marketing of their khash ingredients. She also favors seeing khash become a year-round “delicacy”. “People prefer buying khash in May. Besides, in summer when they climb mountains [where it is cold enough for eating khash] to eat khash there, they take khash with them. When we ourselves go to Sevan in summer, we take khash with us to eat it there early in the morning, when it is very cold there. It is a special pleasure. Very often people, sitting at next tables, leave their barbeque and join us to enjoy khash with us,” Hasmik says. People in ‘Khashi Tagh’ say that along with general food price hikes, no rise in khash price has been registered, it is comparatively the cheapest dish now; and people’s purchasing capacity has not drop. “We do not complain about it, our business is good, there is enough demand, and if we calculate now, we will see that khash remains to be the cheapest dish,” Hasmik says, receiving their next client. Edited by Arpa, 01 May 2011 - 10:47 AM. the only Armenian kind of food that I truly can't stand...and the smell!!!!!!!! Barev Nana, welcome to Hyeforum. Here is the link for new members. he, tents chi? sxal em? Tam tara tam tam tam tam! Dear Nvard . Since you are such a fan of Khash, and you being the one millionth participant, you win a Gift Certificate for two at the above Khashnaran in Ejmiatsin. One for you, and one for your nose. I just contacted the owners of the restaurant and requested that they add two more cloves of garlic to your dish. Of course. I'm sure you know that I am just playing. Look at all the smileys above. But, should you insist you will end up with "aveluk/մնացորդ/leftovers". Edited by Arpa, 04 May 2011 - 07:15 PM. And, btw, do they surve egg'n'tomatoes? It's lunch time I'm super hungry..
Edited by Nvard, 04 May 2011 - 07:33 PM.